Probably the best rear dynamo light currently available, the Toplight Line Plus uses what B&M call LIneTec to spread out the light from two bridge LEDs so that a wide line of light is seen rather than a small bright dot. 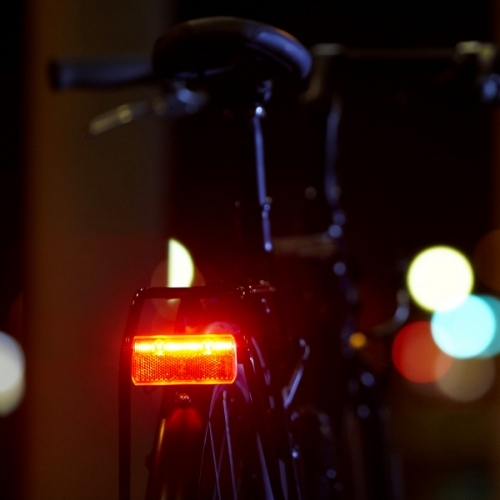 The light includes a standlight, so it keeps glowing when you stop, and also a switch with which the standlight can be extinguished to make your bike more discrete when parked at night. This light is designed to be mounted on a rear rack. It requires two holes separated by 50 mm in the rear rack. Cab also be mounted on saddle rails by using an adaptor. Please see our blog post describing combining of dynamo lighting components. 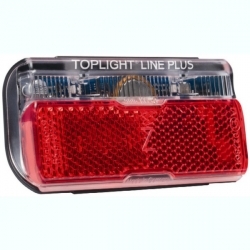 You may also need to buy wire to reach to the front light or dynamo.